You won’t get far from the pyramid before you will have to face a boss. You couldn’t get off that easily. 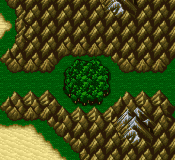 After you enter the miniature forest the Wind Drake appears and brings Lenna. Don’t expect a cheerful greeting, she’s possessed by a demon that Exdeath released from the Interdimensional Rift. This scantily clad sorceress isn’t too tough. The biggest challenge involves scanning for weaknesses each time she does a Barrier Change. She shifts from fire, ice, thunder, or no weaknesses. Take advantage of them. If you attack Melusine with a spell she’s not weak to, she’ll absorb the damage. And don’t think about attacking her physically—at least not while she displays a weakness. She has a 90 def. If she changes into the form without a weakness the opposite is true. She has a 90 mdef and a 0 def. With a well-equipped black mage or mystic knight you can inflict 9,000 points of damage. Make sure you’ve scanned Melusine’s weakness before unleashing a barrage of spells she’ll absorb. Now your only problem is to avoid or absorb Melusine’s attacks. She usually attacks with level 5 black magic spells. And usually she casts the two spells she’s not weak to. She attacks either a single target or the whole party indiscriminately for between 250-750 points of damage. Occasionally she stops casting spells long enough to smack you around a bit. Don’t be daunted. She usually hits for 200 points of damage. Every once in a while she does use Entice and seduces one of your party to her cause. After subduing Melusine, Lenna joins you. Unfortunately she rejoins you as a corpse. Revive her before continuing. Your next stop should be the airship. With it in your possession you can travel just about anywhere you want. After a dizzying display of grief and madness, you end up hovering by the Wind Shrine. West of the Wind Shrine is Regole, and south of Regole lies Kuza, the Sealed Castle. One more thing! : I hit Melusine with the Brave Blade for about 1000 points, regardless of her stats. Just use fire3 at the start with a sorcerer and a black mage, then when she switches, have your black mage use scan (my black mage had the lv. 1 white magic ability) and then use whatever her new weakness is. She only got to Barrier Shift once on me before she died. Ok, I have a virturally fool-proof method of beating this b... boss. Have a heavy fighter on hand. This meant for me a ninja with Twin Lance and a katana. Have a person with blue magic handy. This person will be your healer, but only with high potions! You need all the magic you can get for this fight. The two most important magic types to have, though, are SUMMONING and BLACK MAGIC!!! Without these this boss ill be harder than it needs to be. The first thing to do in this fight is to summon Carbuncle. Only summon Golem as an afterthought, and only after the Reflect wears off. With Reflect on, Melusine's relentless majic attacks will rebound on her. She will heal, but only with minimal damage points, around 830 max. Trust me, this will seem trivial compared to both the damage you will do and the amount of health she absorbs if you screw up. Be sure to keep note of the magic she uses also. If she uses an ice attack, her weakness is NOT ice. Your fighter does nothing but heal during the first stage of the fight. I will suggest, however, to attack Melusine physically once in a while. If she recieves damage, attack mercilessly with all forms of physical damage you can muster. But most likely she won't. So your main course of action is to use 1000 Needles or Aqua Breath with your blue magic person. Any Ethers and Elixirs would be very helpful here, since I would suggest putting the Golden Hairpen on your black magic person. Speaking of which, here comes the most tedious part of the battle, and the reason to take special note of the magic attacks she uses. What you must do is this: Use LV1 Black Magic spells on Melusine, such as Fire, Ice and Thunder (or Bolt in the NES version). If she gives damage to one of them, or absorbs two of them, attack her with the corresponding element as quickly as possible. There is a catch, however. If Melusine absorbs two elements and absorbs the more powerful attack you just used, she is weal to physical attacks. So cast at your own risk. The only affirmitive safegaurd you have to attack her with magic is if she takes damage to one. This is my not-so-fool-proof method of killing Melusine. It has its snags, but this is probably the easiest ay to kill her. Also, just as a side-note, I had 99 High Potions and 28 Pheonix Downs as mere procautions. You might want to follow this too. I've noticed that Melusine still takes full damage from the Blood Sword. Given, the Blood Sword has a horrid hit rate. So, equip it onto a freelancer with !Jump or !Rapid Fire, and the game will ignore the low hit rate. I've noticed that for some reason, Melusine always begins weak against Fire (at least in my experience). I can kill her in 3-4 castings of Firaga if my mages have Fire Rods equipped (which increase the power of Fire spells). The Dinosaur strategy: Have a Mystic Knight 2-hand your Chicken/Brave sword, cast an element, attack, and tape down your A button. At some point, the lady will swap to the appropriate element and die in 2 attacks. Using a Flame Saber with Butz as a Knight kills it in 5 turns.